Day of rest. We had our Stake Conference. After the meetings I talked with a family from Nigeria - they had five children with them. Turned out they were visiting their son who is a student at UVU. I learned from them some things about Nigeria - it was very educational. It is one thing to learn about countries from textbooks and news media, but it is a different experience when you talk to a native. I did not realize that the population of Nigeria was about half of the United States. Yet if you asked the average American to find Nigeria on the map, he probably would fail. A.M. Total of 12.1. Benjamin did 8, Jenny 4, Julia 1, Joseph 3, Jacob 2, William 1. Looks like our aches and pains are beginning to step away. Benjamin felt energetic enough to do an impromtu pickup for the last uphill 0.51 in 2:53. He has struggled with a sore throat for the last two weeks - he still ran a decent race on Tuesday, but he felt weak in the race and in his training runs which he had to cut. Elevated levels of mold were found in his room, sufficent for a sensitive person to experience symptoms, which could be the reason for the problem. Turned out our sprinkler was positioned right next to the foundation, and the water was leaking underneath. We have moved him out of his room as soon as we suspected the problem, but the damage was already done. Julia also did better today - was able to run the mile in 8:16 with much less pain than before. On Friday she battled through that mile in something like 10:30 and with a lot of pain. P.M. 3 miles with Matthew in the stroller. A.M. Kids ran a little warm-up on their own before the cross-country meet. Benjamin did 3, Jenny 1, Joseph 1. Others rested. I did 12.25 total with 4x800 down the Provo Canyon with 800 recovery. The goal was to run around 2:30 for each. I did better than expected. 2:27.9 (73.1, 74.8), 2:26.3 (72.7, 73.6), 2:26.6 (72.7, 73.9), and 2:22.9 (72.1, 70.8). The splits reflect the nature of the course - the first quarter was a nice steady downhill with a little uphill bump at the end, while the second began with the continuation of the bump, then relatively flat 100 meters or so, then a short abrupt downhill, then more or less flat for 100 meters or so, and then 100 meters of mild uphill. In the last one I tried to have a visual imagine of Lasse Viren's long kick, his resilience, his quiet confidence that no matter what he would win, and it did help - the legs just moved through the fatigue and I ran quite a bit better than I thought I would. The visual image is relatively easy to bring up, but it is not easy to translate it into speed - it takes some practice. That is why we do intervals and tempo runs. I do not know what went through Viren's mind when he was kicking, but I like to imagine it was the tune of Finlandia/Be Still My Soul. It very well could have been, but even if it was not, it communicates the message very well, and it is the tune I am familiar with from church. When I am able to catch the spirit of it I can find a few extra seconds per mile in me at the end of a hard workout. P.M. Benjamin, Jenny, Julia, Joseph, Jacob, and William raced in the Kiwani's Park 3 K cross-country meet. 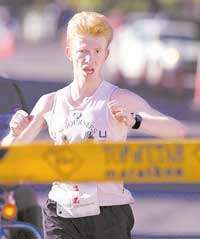 Benjamin won overall with 10:56. He says he got confused on the course, because it was new, and added some distance. Second place, Spencer Jarvis finished in 11:38. Grant was not there. Benjamin says he was feeling weak, weaker than in the 2 K. I am not surprised - it is about time to be reaping the fruit of the reduced mileage from his sickness. Unfortunately, this race is not very indicative of how out of commission he was, so we will do a little evaluation run on Thursday to see where he is at. Joseph had a decent race winning the 8 and under division in 13:53. This is the first time he went under 14:00 in a cross-country 3 K. Jenny was having issues with her back from bending over a lot during the cleanup on Saturday, and ran 14:34 taking 4th place in the 13-14 age division. Jacob was having issues with breathing again, but still managed 14:39 taking second in the age division after Joseph. Julia's piriformis was better, but the reduction in training affected her fitness, and she could only manage 15:09 - good enough for 3rd in the 11-12 age division. William ran a gutsy race - 3K is quite a distance for a 4-year-old - but he was not afraid to jump in and go fast, and was rewarded with a decent time - 18:40 which was good enough for 6th place in the 8 and under age division. A.M. Total of 12.Benjamin did 8, Jenny 4, Julia 2, Joseph 3, Jacob 2, William 1. I did a pickup for 0.51 in 2:50 uphill at the end of everything. P.M. 5 miles in 36:55 with Joseph and Jacob following me on their bikes. A.M. 12 total. Benjamin did 8, Jenny 4, Julia 2, Jacob 2, Joseph 3, William 1. Jenny did a little workout. My intuition told me she needed scheduled fast running in the middle of her regular run. She's had a rough couple of years, actually more than a couple, when she hit her growth spurt. Growth spurt is good for boys, but often wreaks havoc for girls, and it did for her. There has not been a day in the last three years when we did not have to solve some kind of a problem - chronically sore muscles, back pain, fatigue, being unusually out of breath at relatively slow speeds, quick dehydration, and others. The side effect of that is that her training has been at a very slow pace - around 8:30 - 9:00. Some of the mileage at her fitness level can be done in that zone, but not all of it. The challenge in getting her to go faster has been her perception that that pace was all she could do. So I had a thought - she needs to spice things up in the middle of her run, and had her run a quicker 0.5 mile stretch from 2 to 2.5 which is a slight downhill with nice tailwind. Even though I knew that she was capable of more, to remove the psychological pressure I told her I only expected 7:30 pace, but hoped to see something slightly quicker. I did see something quite a bit quicker - 3:17 for 0.5, or in other words 6:34 mile pace. Her cooldown after that confirmed my intuition - she was running 8:20 pace and thought she was resting. After Benjamin's 3 K experience I wanted to know what was up with his fitness. So I had him do our 2 mile uphill course from 800 N bridge to the house. To remove unnecessary psychological pressure I did not give him any specific pace guidelines except that it had to be faster than 6:00 which was more or less a no-brainer. I also told him that if he did not feel good we were not going to finish the interval. I let him set the pace and just followed trying to be not much of a factor. I divide the course into splits of 0.5, but they are not exact as in wheel-certified, and I know the last one is actually 0.51 from a wheel measurement. His splits were 2:51, 2:45, 2:45, and 2:52 for the uphill one that I know to be 0.51, total of 11:13.9. He said he felt quite a bit stronger than in the 3 K, and was not sure if he felt stronger or not than in the 2 K. All in all, this is a good indication that his fitness is returning. It was also good to get a reliable fitness measure on a course I trust. On the positive side of things for me I did not get dropped this time and ran faster (although I probably still would have been dropped had Benjamin been 100%), and actually felt much better than when we did it on Aug 22. So hopefully that means I am in better shape. We'll see in the Big Cottonwood Canyon Half Saturday and in the TOU a week later. William started the run a little bit faster than normal, so we decided to encourage him to try to break 9:00. He had permission to spank Benjamin (I was pushing the stroller which made it diffucult to approach me), which greatly helped the cause. His first quarter was 2:20, then 2:18, 2:09 and 2:05 - 8:52.9. Again, the same wheeled out-and-back course, no hand holding. So William is now a sub-9:00 miler - first time we've had a kid that went sub-9:00 before turning 5. Now we can say that in our family if you cannot break 9:00 in the mile we make you wear a diaper - the only people that have not done it yet are Stephen (age 3) and Matthew (8.5 months). Now I suppose the "wear a diaper if you are not sub-9:00" is not that big of a deal if mom and dad are reasonably fit, you have a kid or two that are little, or if they are spread enough apart that they are either wearing diapers or are old enough that sub-9:00 is no big deal for them. But for a family with 8 kids with the oldest being 14 I imagine that is rare. A.M. Total of 12. Ran with the kids. Benjamin did 8, Jenny 4, Joseph 3, Jacob 2, William 1. Joseph and Jacob did a mile time trial on the track. Both got a PR. Joseph ran 6:22.0 - PR by 4 seconds. His lap splits were 93, 96, 95, 95 with the balance going to rounding error and the extra 9.34 meters that separate the real mile from the four laps around the 400 meter track. I explained to him that the most important lap was the third, and the second most important was the second. He got that about the third, but was a little fuzzy about the second. He also had a hard time kicking. That concerns me a little - I noticed he does not eat quite as much as I would expect him to, has not yet broken 18 in 100 even though his longer distance performances suggest he should be able to, and has always been relatively small for his age. I am going to see if there is something we can do to boost his appetite. It might be as simple as feeding him the foods that he more easily digests. Jacob ran 6:46.3 - PR by 9 seconds. I knew he would likely struggle with asthma so we paced it accordingly. First lap a little faster to build a cushion. Then easier on the second two laps when the attack comes while the muscles do rest some. Hopefully by then the attack subsides, and he can kick. It worked out as planned. The splits were 1:35, 1:45, 1:44, 1:39 with the balance goings to the mile tax commission. The attack did come. He ran 7:00 pace through it. It eventually subsided some and he was able to kick with fresher legs. His last 100 was 23, same as Joseph's.